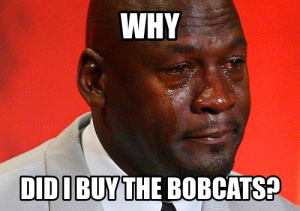 Whack a Meme: Is It Possible to Contain (Let Alone Stop) the “Crying Jordan”? Almost everyone (even my parents) has seen the Crying Michael Jordan meme popping up around the internet and social media. Crying Jordan has appeared in the standard meme form of photoshopped images and gifs but has also inspired Halloween masks and even customized Air Jordan sneakers. TMZ reports that Jordan doesn’t have a problem with it, as long as no one uses it to “promote their commercial interests.” But what if he changed his mind or someone started using it for commercial gain? Could Jordan protect himself against “unauthorized memeing”?